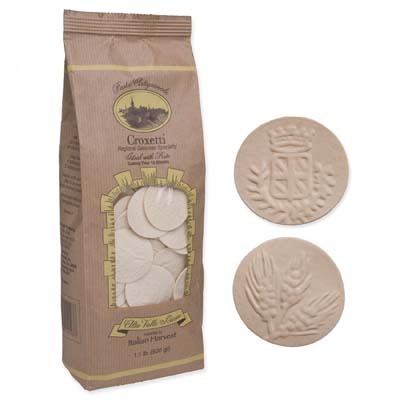 Looking more like special decorative cookies than pasta, this pack of lovely organic Croxetti are from Alta Valle Scrivia. It is a type of pasta that’s typical of northern Italy, particularly the Liguria region. Each piece is like a flat dough medallion that is stamped with Genoa’s coat of arms and a stalk of wheat. You can serve this pasta with meat, pesto, or mushroom sauces. Light sauces will also go nicely with it. You may also each pretty pasta tastes like dunpling when you cook it. Curious about these pretty pasta discs? Grab a bag and get cooking then!